Bluetooth Headphone Test – Listen, Inc. This sequence tests the send and receive performance of a stereo Bluetooth headset with a built-in microphone using a mixture of analog and digital channels. The left and right earphones are measured simultaneously with a stepped sweep from 20 kHz to 20 Hz using two Bluetooth profiles: A2DP and HFP. The mic is measured with a stepped sweep from 8 kHz to 100 Hz using the HFP profile. A short 1 kHz tone is pre-pended to the test stimulus which serves as reference tone for resampling and frequency shift operations. Post-processing resampling and frequency shift precisely synchronizes the stimulus and response waveforms prior to analysis. 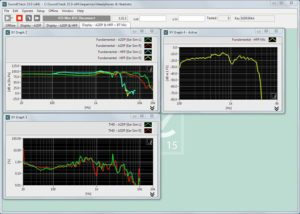 In this case, the HarmonicTrak algorithm is used for frequency response and THD analysis. A2DP frequency response and THD curves are displayed on the first display, followed by A2DP & HFP curves superimposed on a subsequent display. Lastly, the Bluetooth headset’s microphone is tested with HFP and its frequency response is shown on the final display along with the previously collected data.